The objective of this Lab activity is to study the phenomenon of resonance in RLC circuits. Determine the resonant frequency and bandwidth of the given network using the amplitude response to a sinusoidal source. In this tutorials we use the terminology taken from the user manual when referring to the connections to the Red Pitaya STEMlab board hardware. Oscilloscope & Signal generator application is used for generating and observing signals on the circuit. Bode analyzer application is used to measure frequency response of RLC circuit. A resonant circuit, also called a tuned circuit consists of an inductor and a capacitor together with a voltage or current source. It is one of the most important circuits used in electronics. For example, a resonant circuit, in one of many forms, allows us to tune into a desired radio or television station from the vast number of signals that are around us at any time. A network is in resonance when the voltage and current at the network input terminals are in phase and the input impedance of the network is purely resistive. Frequency Response: It is a plot of the magnitude of the output Voltage of a resonance circuit as function of frequency. The response of course starts at zero, reaches a maximum value in the vicinity of the natural resonant frequency, and then drops again to zero as ω becomes infinite. The frequency response is shown in figure 2. Additional Calculation: Using one of the sw tools such is Matlab or Python we can calculate the impedance of the parallel RLC circuit from Figure 1. The admittance(Y) of the parallel circuit is given in equation 1 above where impedance Z is given as Z = 1 / Y. The resonance frequency is defined as the frequency at which the impedance of the circuit is at a minimum. 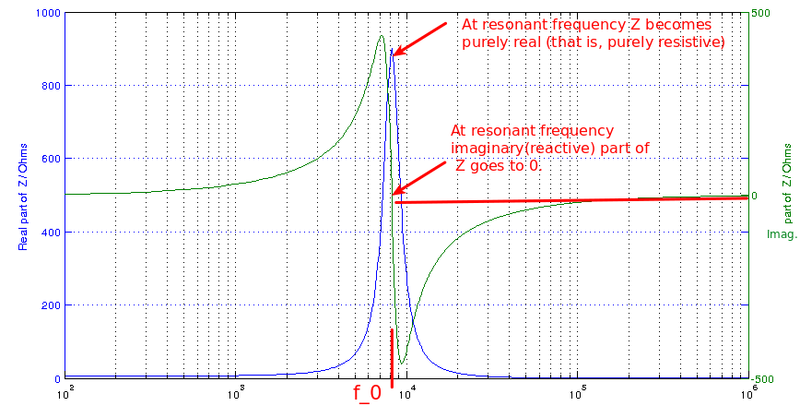 Equivalently, it can be defined as the frequency at which the impedance is purely real (that is, purely resistive). This occurs because the impedances of the inductor and capacitor at resonance are equal but of opposite sign and cancel out. 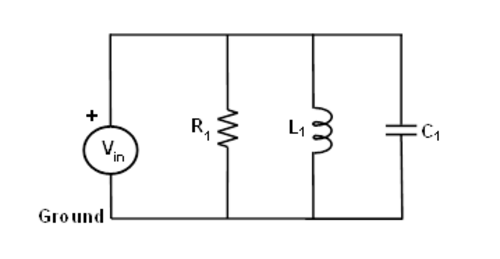 Circuits where L and C are in parallel rather than series actually have a maximum impedance rather than a minimum impedance. For this reason they are often described as antiresonators, it is still usual, however, to name the frequency at which this occurs as the resonance frequency. Matlab code for calculation of \(Z\) is given below. By running code above we get following results shown on picture bellow. Fig. 8.4 Figure 4: Calculation of the Impedance Z of parallel RLC circuit. Blue trace real/resistive part of Z, green trace imaginary/reactive part of Z. We can also calculate absolute value of Z which is the combined impedance of RLC circuit from Figure 1. Absolute value of Impedance Z is the parameter form which we can predict what the measurements should look like. We can model the circuit from Figure 8 as is shown on figure below where Z = 1/Y and Y is given in equation 1. From figure 5 above we can clearly see that our circuit is simple voltage divider where Vout=Vin*Z/(Rs+Z). But since the Z is frequency dependent the ratio between Z and Rs will be frequency dependent and with that the Vin/Vout ratio. At some frequency f: where the value of Z is much smaller than value of Rs the output voltage amplitude will be much smaller than input voltage amplitude. At some frequency f: where Z=Rs the Vout will be ½ Vin. At some frequency f: where Z is maximal the Vout will be also maximal. This is the resonant frequency. Fig. 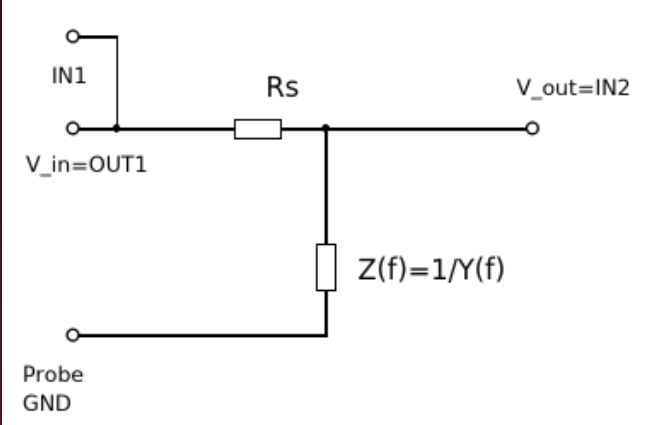 8.6 Figure 6: Calculation of absolute value of impedance Z for the circuit shown on figure 3.
we can calculate the frequency response of our RLC circuit shown in Figs. 5 and 8. Fig. 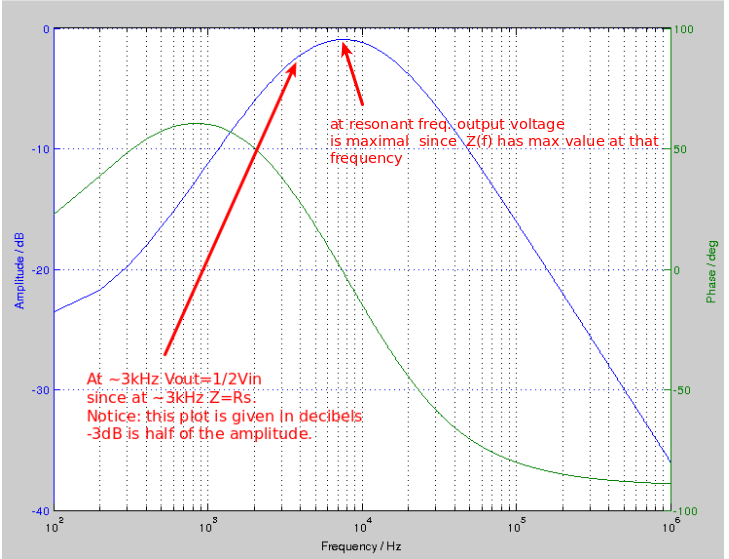 8.7 Figure 7: Calculation of frequency response (Vout/Vin) for circuit on figure 5. 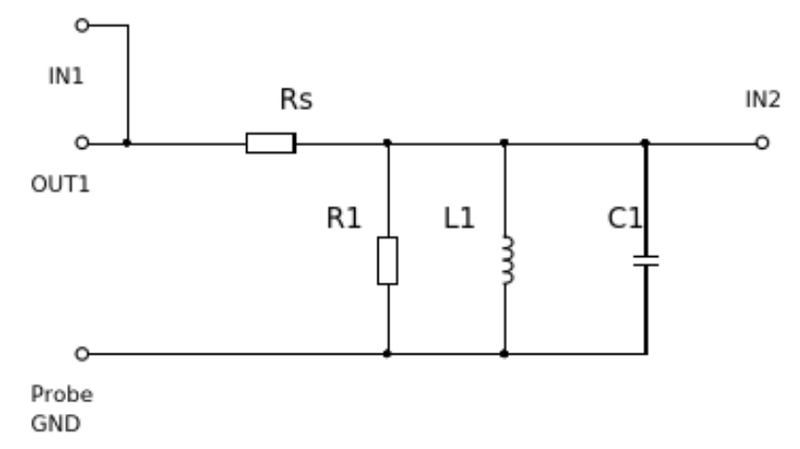 Set up the RLC circuit as shown in figure 8 on your solderless breadboard, with the component values RS = 100 Ω, R1 = 1 KΩ, C1 = 0.1 µF and L1= 4.7 mH. Fig. 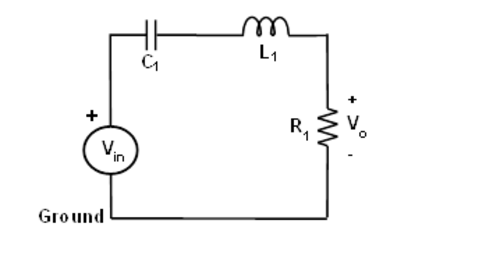 8.8 Figure 8: Parallel RLC circuit for the measurements. 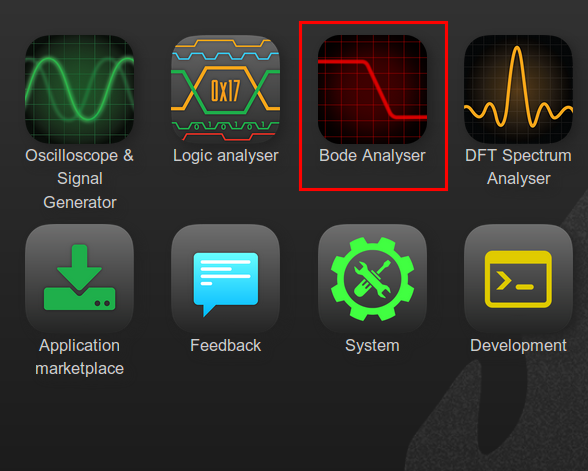 Open the Bode analyzer application. In “Settings” menu set start frequency to 100Hz, end frequency to 1MHz and number of steps to 50. And Click “RUN” button. 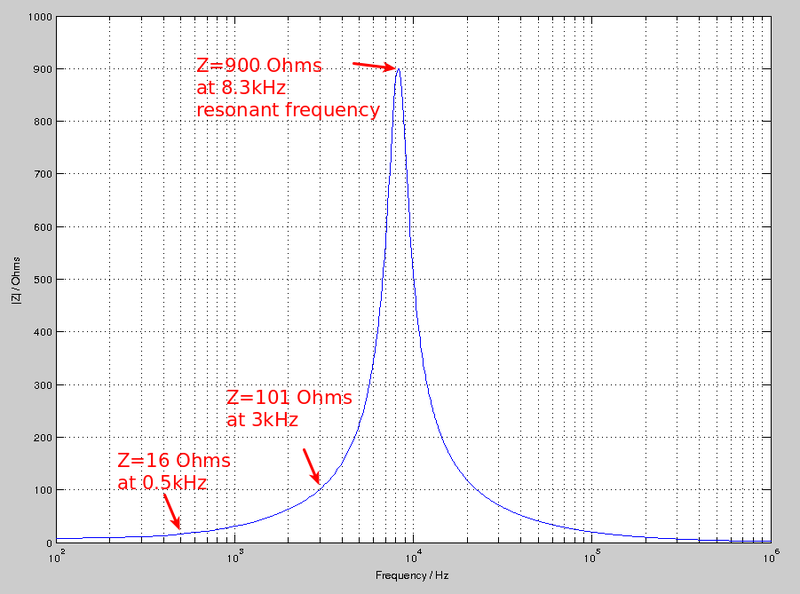 After the measurements are done you should get the frequency response of your circuit as is shown on Figure 10q. Fig. 8.10 Figure 10: Frequency response of circuit from Figure 8 take by Bode analyzer application. Compare measurements and calculation. If there is any difference try to explain why. The Bode analyzer application will make a frequency sweep in such way it will generate sine signal on OUT1 within frequency range selected by us(in settings menu). IN1 input signal is directly connected to OUT1 following that IN1=Vin. IN2 is connected on the other side of the RLC circuit and from that IN2=Vout. Bode analyzer application will then for each frequency step take the ratio of IN1/IN2 and calculate frequency response. On order to see how Vout/IN2 signal amplitude is changing in respect to OUT1 start the Oscilloscope application, in OUT1 settings enable OUT1, deselect SHOW button and look at the signal amplitudes of IN1 and IN2. Change the OUT1 frequency, adjust t/div value so you have 2 cycles of the IN1 and observe the amplitudes of IN1 and IN2. Repeat this step for OUT1 frequency from 100Hz to 1MHz and you should observe same amplitude response as it is measured by Bode analyzer application. Bode analyzer is also measuring phase between IN1 and IN2. Phase is also frequency dependent. You can see that easily wit the Oscilloscope application. Repeat the experiment using for the series resonant circuit in figure 3, and use L1 = 20 mH and C1 = 0.01 uF and R1 = 1 KΩ. The Vo voltage on the resistor is proportional to the series RLC circuit current. Plot the voltage response of the circuit and obtain the bandwidth from the half-power frequencies using equation (3).